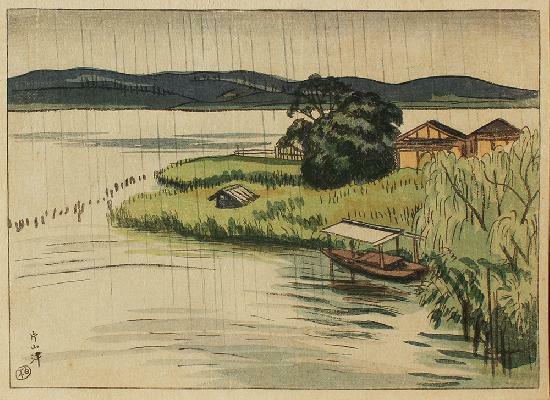 Katayama harbor in the rain, from the first set of the series Nihon fūkei hanga - Japan scenery prints, published in 1917. Paper size: 24.8 x 18.1 cm. Still attached to the original supporting sheet, as published. Fine impression and colours, very good condition: discoloration of the thin cardboard sheet to which the print is attached, but the print itself is clean, apart from a tiny spot bottom left.